Welcome to the Technoethical shop! We refurbish and sell only grade A, high quality devices compatbile with fully free operating systems. 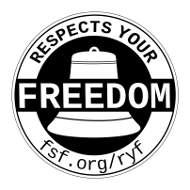 All our laptops are pre-installed with a completely libre BIOS (Libreboot) and a completely libre OS (Trisquel), and are certified by the Free Software Foundation to Respect Your Freedom (RYF). 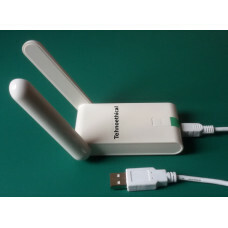 With the refurbished Technoethical N300 High Gain Antennas Wireless USB Adapter for GNU/Linux-libre you can connect to Wi-Fi networks using exclusively free software. With its two external swivel antennas having 2x2:2 MIMO configuration, it can reach speeds up to 300Mbps. You might also be interested in the Technoethical N150 Mini, the Technoethical N150 High Gain Antenna, and the Technoethical N300 Wireless USB adapters. The Technoethical N300HGA is composed of the Atheros AR7010+AR9287 integrated circuits. It works with the free driver ath9k_htc (GNU GPL v2) and the free firmware for ath9k_htc (Clear BSD). Thus you can use it with a completely free GNU/Linux distribution, which has the kernel Linux-libre, clean of the nonfree blobs from Linux. Using the latest versions of the kernel (3.0 or later), the adapter works out of the box when plugging it on USB, and you don't have to manually install the firmware anymore. Because the firmware is free, you can study it and check what exactly it's doing. Moreover, you can modify the way the adapter works, so it can be an important resource for educational experiments or for your business. With the Technoethical N300HGA Wireless USB adapter, your are in control of your own computer for connecting to Wi-Fi networks too. Buy it for your laptop! You have a laptop with a Wi-Fi card which doesn't work with free software or it's broken. Plug the Technoethical N300HGA adapter in an USB port and connect to Internet. Buy it for your desktop! You have a dektop computer and want to get rid of the wires. Plug the Technoethical N300HGA adapter in an USB port and connect to Internet. You get rid of the wire and you continue to use free software. Buy it for your development board! You have a development board or an embedded device without an integrated circuit for connecting to Wi-Fi networks or with one which doesn't work with free software. Plug the Technoethical N300HGA adapter in an USB port and control your device remotely (also through Internet). Technoethical donates parts of its income to different free software projects. We list the donations on the page Technoethical donations. This adapter is produced by TP-Link, refurbished by Technoethical and sold under its own brand, as a warranty that the integrated circuits work with free software.